A Maine All-state player two years, Brett led South Portland High School to two Western Maine Championships and the State Championship in 1979. Brett, a Vinal Trophy winner and a Converse All-American, accepted a full scholarship to Boston University where he played for coach Rick Pitino. He was the captain of the Boston Univ. basketball team and it’s MVP his sophomore season. Brett served as the Asst. Coach to the San Antonio Spurs and helped them win three World Championships. 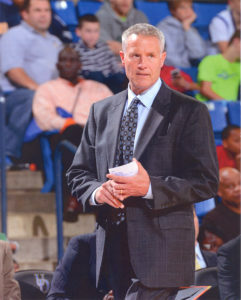 He also served as the Australian Olympic Coach in 2012 and is currently the head coach of the Philadelphia 76ers.